Furniture Republic drew an A-list crowd to its recent showroom grand opening at Lucky Chinatown Binondo, Manila. Special guest included Sarah Geronimo, Philippine’s Popstar Princess; Leo Almeria, a multi-awarded Filipino interior designer, product designer, stylist/ floral designer; Natividad Cheng, President-Polyfoam International Corp.; and Araceli Dannug, General Manager- FC Home Center. Meanwhile, the event which was also attended to by local contractors and interior designers officially marked the opening of Furniture Republic’s 8th showroom nationwide. 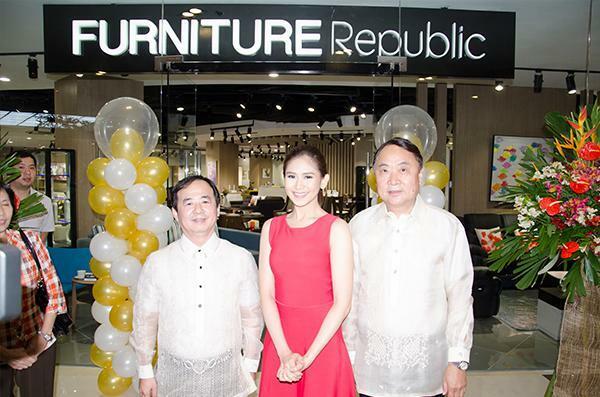 Among her many product endorsements, Asia’s Popstar Royalty has found another love in Furniture Republic showroom. Because, now, buying mid-level furniture at affordable price is easy. With the A-listers! Ms. Sarah Geronimo was flanked by Mr. Leo Almeria; a notable Interior Designer in the Philippines and abroad and Ms. Natividad Cheng; President, Uratex Philippines with SY Executives and their spouses on both sides. Ms. Sarah Geronimo and Ms. Evette dela Cruz, Marketing Manager of San-Yang Intertrade Corporation doing the plugs for Furniture Republic Lucky Chinatown Grand Opening last January 15, 2016. Father Luis Sierra from the Binondo Chinese Church doing the blessing. Ribbon Cutting from L-R: Leo Almeria, an internationally renowned Filipino Interior Designer; Araceli Dannug, General Manager, FC Home Center; Tony T. Sy, General Manager, San-Yang Intertrade Corporation; Tomas Cua, President, San-Yang Intertrade Corporation; Sarah Geronimo, Brand Ambassadress. Good Vibes! Ms. Sarah Geronimo with Furniture Republic Store Supervisor and staff. In keeping with Chinese traditions, coins and candies were thrown towards the store for good luck.